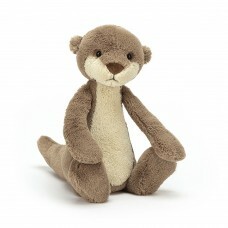 Bashful Otter is a charismatic scamp, full of wriggly jiggles and cheeky charm! This river pal is biscuity-sweet with a long, creamy tum, chocolate-drop nose and neat wee ears. Strong, soft paws and a squashy tail help Bashful Otter swim and steer!